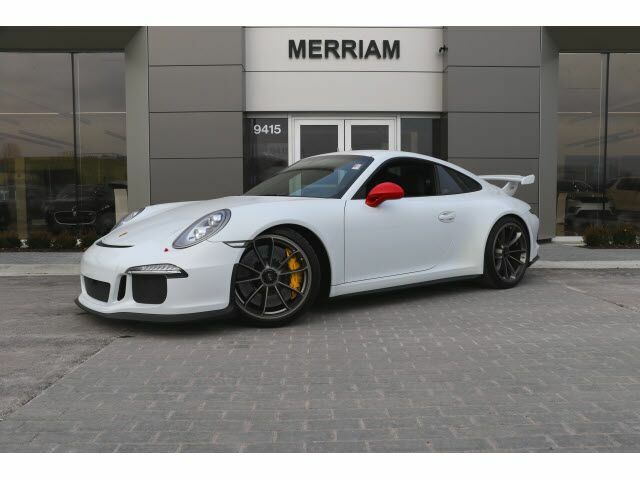 2015 GT3 in Carrara White Metallic over Leather/Alcantara Interior in Black with Red Stitching. Clean 2-owner Carfax, local trade-in. Clean Inside and Out and Very Nicely Optioned with Porsche Ceramic Composite Brakes (PCCB), Heated Seats, Front Axle Lift System, Sound Package Plus, Fire Extinguisher, LED Headlights with Porsche Dynamic Light System (PDLS), Light Design Package, Sport Chrono Package with Porsche Track Precision App, Sport Design Leather Steering Wheel, Instrument and Sport Chrono Dials in Guards Red, Extended Interior Package, Aluminum Pedals and Footrest, Active Sport Seats 18-way, Navigation, Guards Red Seat Belts, Stainless Steel Illuminated Door Sills, Clear Glass Taillights, and More! Please Contact Brian Stacy 1-855-979-0255 to Test Drive Today! Aristocrat Motors, Kansas City's premier luxury dealer strives for the highest levels of customer service. Voted "Best in Business" by the readers of Ingram's magazine, our customers are our number one priority.